- A fix has been made to allow setting user "available space" setting to "unlimited." In Userly.org, we have updated the platform to latest version with some minor UI and UX changes. The payment option has been removed from the home page. And there is forever free plan for all the users. UnelmaMovie, which is a free online database of movies for preview and streaming is now an official partner of The Movie Database (TMDB). This partnership allows us to use the official API of TMDB in the UnelmaMovie platform. 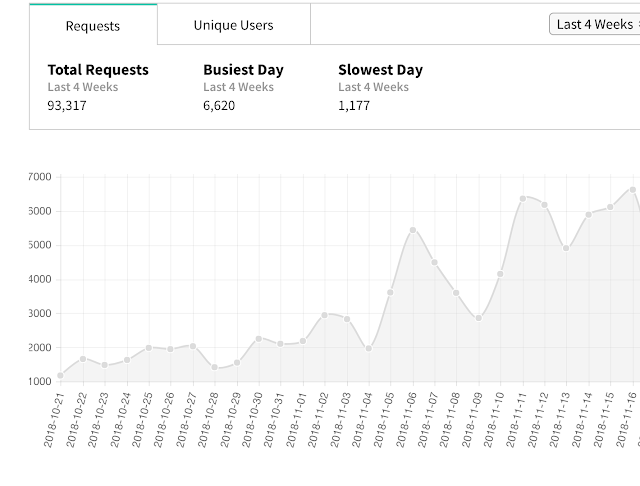 A recent API request shows about 100,000 calls made in UnelmaMovie within the last four weeks of the usage. In short, TMDB is a crowd-sourced movie database which is used by many companies across different apps, websites and platforms in order to list more than 400k movies that they have in their database. Compared to IMDb they have a comprehensive list of Hollywood films. The current stats from TMDB shows 1 million TV episodes and 77k TV shows with more 1 million community of moviegoers and movie lovers contributing to the TMDB community. We have updated our support platform and email marketing automation platform. This new version update or patch comes with some handy features and set of tools for our customers. Unelma Platforms received Legal Entity Identifier and DUNS number. Some legal and financial news which we would like to share with you. Unelma Platforms have received LEI and DUNS number. "Companies and entities, for example, registered associations and foundations, need an LEI code when trading in listed shares, exchange-traded fund (ETF) units and other securities or derivatives listed on the stock exchange. Banks and investment service providers do not accept orders from companies or entities with no valid LEI code."